Merely hours after leaving Berlin, the Italian Minister of Foreign Affairs Paolo Gentiloni was on the other side of the world. Despite several pressing engagements, particularly with the United Nations, Gentiloni set aside valuable time in his busy schedule to meet with representatives from the Italian and Italian-American communities. 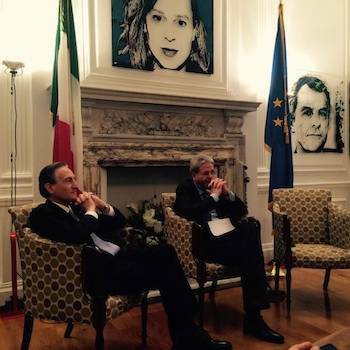 The tone of the occasion at the Italian Consulate in New York was both official and friendly. 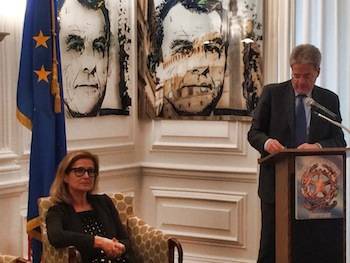 Consul Natalia Quintavalle welcomed the Minister, while Claudio Bisogniero, the Italian Ambassador to the United States, accompanied Gentiloni to the meeting. Quintavalle began by acknowledging the diligent work done to foster innovation in the departments of commerce, art and culture. She announced that this theme, in keeping with the spirit of Italian culture month, will be the focus of an event, at the Italian Cultural Institute of New York, by the Science and Technology Museum in Milan. 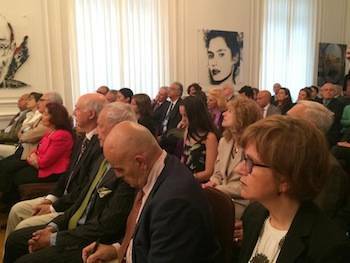 The Ambassador used this moment to underline the colossal, deeply influential presence of the Italian community in New York City. 83,000 Italians are AIRE members, with many holding important positions in the organization. Lest we forget the high number of Americans of Italian ancestry. The minister then discussed the many signs of optimism in the Italian economy. The man in charge of the Farnesina delved into details when discussing the specifics of economic growth in Italy. He began by analysing the auto industry, noting the rise in Fiat’s profits both at home and abroad. The high turnout at the Expo exhibition in Milan was also mentioned, specifically the presence of Michelle Obama. Belief in a bright future is necessary, and Gentiloni stated that he was in the process of innovating the entire nation. The Minister claimed that without innovation, the country would quickly slide down the slippery slope to lengthy stagnation and devastating inertia. Several signals indicate that the Great Recession is buried once and for all; for instance, Italians are now consuming more goods, as is shown by Fiat’s rise in automobile sales. 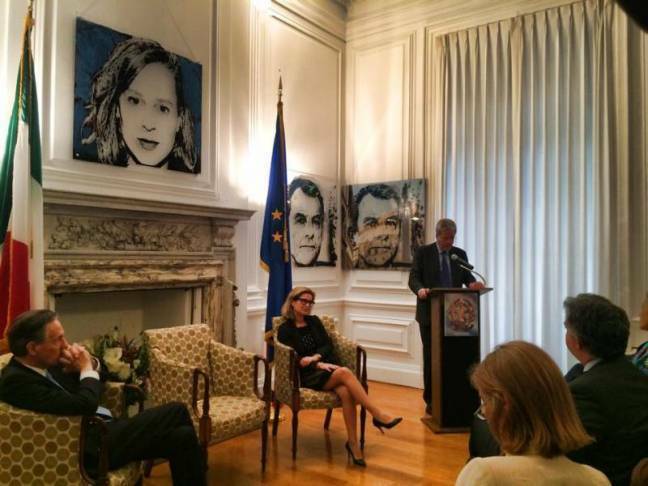 Gentiloni also made reference to the possibility of a Greek exit – commonly referred to as Grexit – from the euro. He stated that although it is in everyone’s best interests to avoid this eventuality, the Italian economy would flourish regardless of the outcome, and that the negative effects of a Grexit would not overshadow the growth that has hitherto occurred. The public and the pressasked several questions. One interesting inquiry, made by Stefano Vaccara of the Voice of New York, outlined the contradiction derived from the administration’s support of both consumerism and the Pope’s most recent encyclical. The Minister responded by reiterating his commitment to formulating international strategies to promote sustainable development, but insisted that this must not be accomplished at the expense of economic growth. He noted that increasing consumption yields more jobs, and that dignity of work is a fundamental ideal in the eyes of the Pope. Massimo Tommasoli, another reporter from ONG IDEA, shifted the conversation towards the Millenium Development Goals, human rights and democracy. He claimed that these used to be key ideas central to UN debates, but that they were now rarely uttered. Tommasoli called upon the Minister of Foreign Affairs to make these themes a central component of UN discussion.